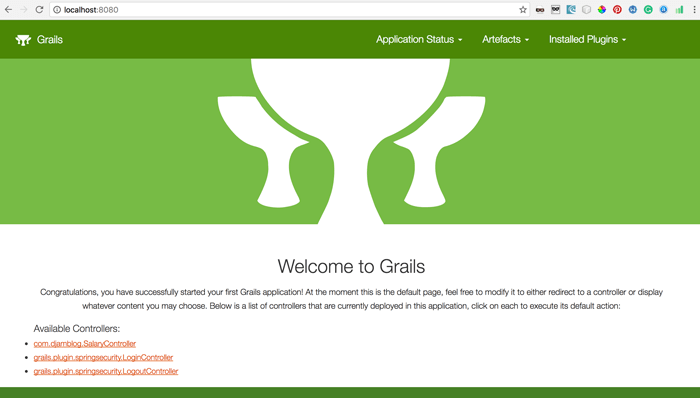 How to integrated Grails 3 Spring Security Core and MongoDB plugins for web application authentication in step by step tutorial. Previously, we have learned how to use Grails 3 with MongoDB. Now, we will continue to add an authentication using Spring Security Core Plugin. This is a combination of Grails 3 Spring Security Core and MongoDB. Will be better if we started from scratch. Let's create the new application, go to project folder then create new Grails application. This command will create new Grails application named with "grails3-authentication". Next, go to new project folder created. Next, we have to add spring-security-core and mongodb plugins. Open file build.gradle in root of project with your favorite text editor or IDE. Then, add this lines in main depencies. Comment this lines in dependencies. Also this line in buildscript dependencies. Compile your project using this command. Next, we have to create user and role domain using this command. This command will create User and Authority domain which Authority is Role. Also, relation between this 2 domain will created with name UserAuthority. Because we are using MongoDB which not supported many to many relationships, we have to modify some generated files. 1. Delete UserAuthority.groovy, it's not longer used. 2. Remove this lines inside User.groovy. 3. Add this line to User.groovy in a place where above code removed. 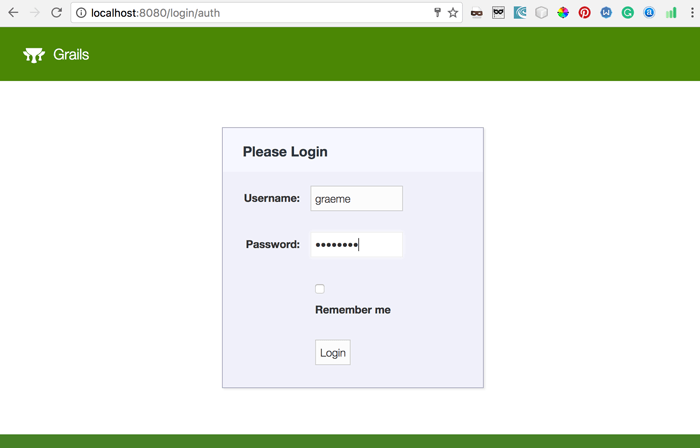 Now, we have to create a test user for that created domain by adding some lines in grails-app/init/Bootstrap.groovy. Don't forget to import that domain in the top of Bootstrap.groovy file. In Bootstrap.groovy we have added a role and a user. A role is "ROLE_USER", a role name must be "ROLE_" prefix. User has embedded collection to "ROLE_USER". Now, we have to make a domain that will be secured by Spring Security. It means every access to that domain, controller and view must be authenticated a user. For it, we create the new domain. This command will create new domain class named Salary. Fill this domain class with fields below. Next, generate controller and views for this domain class. This command will create full function of CRUD by generating controller and views. To make Salary controller secured to "ROLE_USER" add this line in grails-app/conf/Application.groovy. Next, test your spring security by running application. As you can see, at left bottom of the screen there is salary, login and logout controller. If you click salary controller, it will redirect to login page. Supply username and password that previously added in Bootstrap.groovy. If you log in with valid credentials, it will be redirected to salary page. By default, logout using post. To make logout using standard link add this config inside grails-app/conf/Application.groovy. Now, open grails-app/views/layout/main.gsp then add this tag inside navbar. Stop the application and run again. Click on salary controller then login again. You can see username name logout button at the right top of the screen. When you click logout button it will return to home page. Now, you might say these things too easy. Right, this is Grails 3 and it made for boost your web development faster and powerful.